Libertopia announces the best libertarian fiction for 2017: As part of our mission to help encourage liberty in the arts, the team here at libertopia is extremely proud to announce the winner for the Adult Category of our 2017 Art and Creative Writing Contest (Find the details of the 2017 Contest right here)! 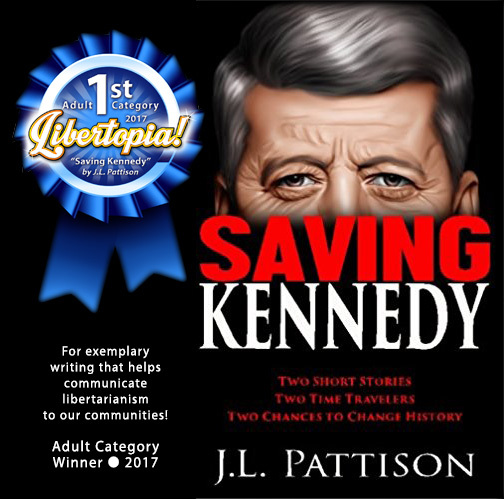 After J.L Pattison sent us a copy of Saving Kennedy, we read it and found it to be the absolute best fiction with a liberty message that we’ve read this year! This well-written and exciting book, which incorporates two fictional stories revolving around the events of the Kennedy Assassination, is a thought-provoking look into this fascinating period of 1960’s history. Having recently watched the Twilight Zone series, the comparisons some have drawn between it and the stories contained within this book is pretty spot on. I could almost imagine Rod Serling introducing each story with, “You are about to enter another dimension….” Perfect for teens and adults (and possibly even younger kids), Saving Kennedy does an excellent job at entertaining, while weaving in some great liberty themes and life wisdom without becoming heavy-handed. And it’s “easy to digest” size makes it a great gift for a family member, co-worker or friend. Saving Kennedy contains two suspenseful tales of time travel gone wrong, both intersecting with attempts to stop the assassination of JFK. In an effort to bring an urgent message to the past, a time traveler ends up in the wrong place at the wrong time and must rely on a humble corn farmer to deliver his letter to the world. But will anyone believe the farmer’s wild story about the time traveler and his warnings in time to stop JFK’s assassination? The mission was simple: save JFK’s life by stopping the alleged assassin. But when the time traveler unwittingly becomes Lee Harvey Oswald’s alibi, his mission changes from saving the president to saving Oswald. And the situation only gets worse when the time traveler discovers he’s trapped in 1963. Decades later, when the wife of his future grandson attempts to ensure the mission’s success by confronting the time traveler before his trip, she quickly learns that meddling in the affairs of the past always has its consequences. To order your very own copy of these highly recommended stories (Alibi Interrupted and The Visitor), please click on Saving Kennedy. And if you’d like to read more from J.L. Pattison, be sure to check out his blog here. Meanwhile, J.L. wins a congratulatory certificate featuring his book (which we will mail to him), an icon to use on his blog site and a prize from the libertopia store! 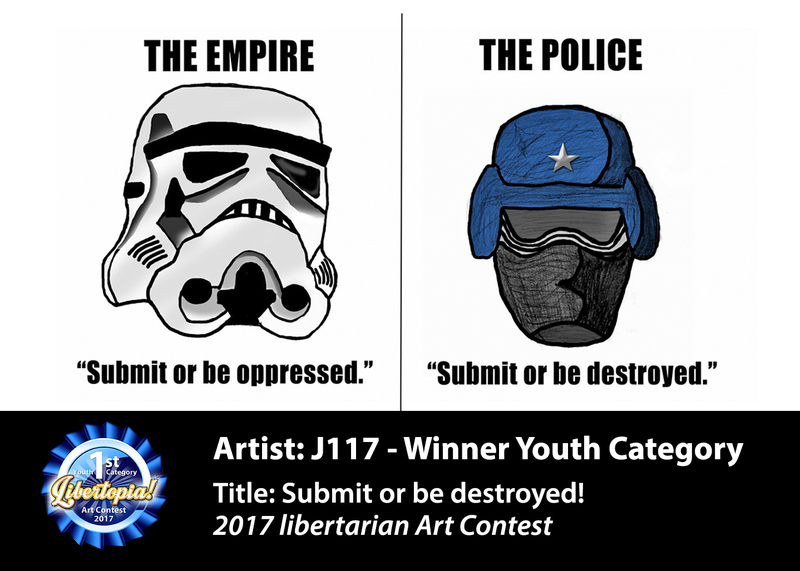 If you missed out on this year’s libertarian / voluntaryist / ancap art and writing contest, don’t worry – we’re planning another great one for next year! Also, a big “THANK YOU” goes out to J117 for his entry Submit or Be Destroyed (winner of the 2017 Youth Category). Check out more about this amazing piece of artwork here! Curious to learn more? Want to get in on the fun? Let us know if you’re an artist or creative who would like to be featured in an interview, or have your artwork displayed on our site! Also, be sure to check out our libertarian artists page for our artist interviews and artwork from a variety of different artists in our community! You can also check out Libertopia’s own artwork page here, download our 60 page art ebook at Libertopia: Collection One (which is on sale for 99 cents) or check out our unique t-shirts, coffee cups and so much more over at the libertopia store! This entry was posted in Uncategorized and tagged 1960's, Alibi Interrupted, ancap, art and writing contest, artwork, J.L. Pattison, Kennedy Assassination, Lee Harvey Oswald, Libertarian, libertarian artists, Libertopia, Liberty, Rod Serling, Saving Kennedy, the best libertarian fiction, The Visitor, Twilight Zone, Voluntaryist. Bookmark the permalink. Just read this book aloud to my husband while on a road trip. Sure passed some time for us quickly while he hung on my every word! Loved it, and oh the message!